As most Animal Crossing fans know by now, the release date for the English version of Animal Crossing: New Leaf for the 3DS has been announced: June 9 for North America and June 14 for Europe. I don’t have any extreme emotions towards the date itself (June or later was what I was expecting, so I’m glad it wasn’t pushed back further than that), I’m just thrilled and excited that there is now a specific, concrete date that I can mark my calendar with, count down for, and look forward to. And now that my obtaining AC:NL isn’t in the vague category of the not-too-distant-future, but rather has a definite date, psychologically it almost feels like a deadline to figure out things like my town name, my character name, and what I want my town to be like by then. So I have been thinking more about these things since the release date was announced. Fruit: I like apples and peaches best, but I’m not too picky about the official town fruit. 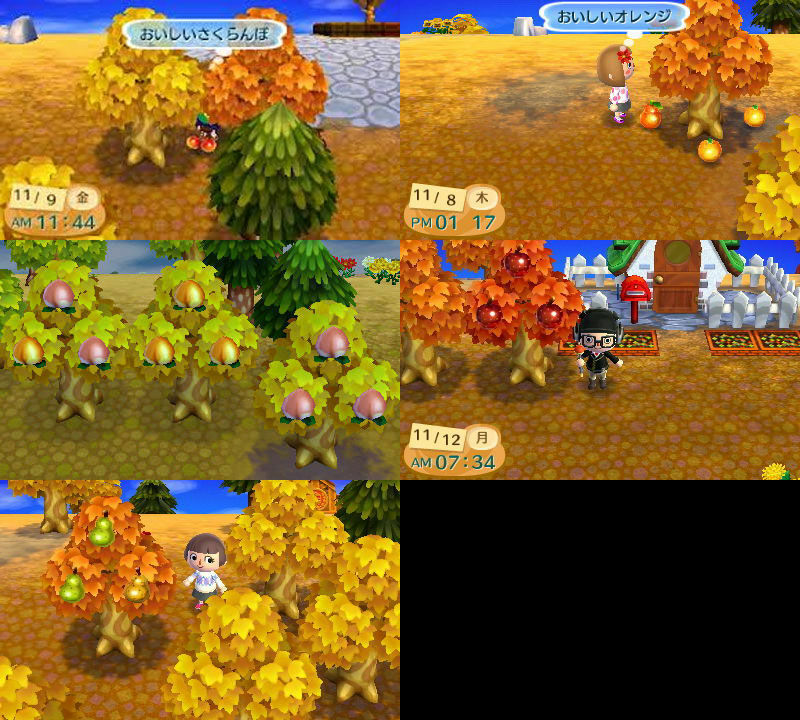 You can always plant different fruit trees later. Grass: Hoping for triangle grass/square snow. Town Map: The town maps are pretty different in AC:NL. (Check out this post for info. 🙂 ) At 5 acres wide and 4 acres tall, they are larger than AC:WW towns and smaller than AC:CF towns. The town is bordered on two sides by the ocean, which is new. As usual, there is a river running through town to meet the ocean at the town’s border, but there are no split rivers available this time. In general, I like really curvy, winding rivers in town maps. But the more winding a river is, the longer it is and the more space it takes up, and I’ve heard that space in AC:NL towns can get pretty cramped because of all the new town projects and sites you can build. So now I’m re-thinking what I want my town’s river to be like; in this case, a simpler river might be better. I might just have to wait until I actually get the game and see if there’s a charming layout and town that jumps out at me. I also like having multiple ponds in Animal Crossing towns, so I’ll be keeping an eye out for that as well. House location: I plan on having one character’s (probably my main one, who I’m thinking about naming Lyra or Violet…I’ll think about it more) house being near the waterfall. The other characters’ house locations will probably have to be determined once I pick out a town. Therefore, the original style it comes in might not be so important; I may or may not reset for a specific basic style that I like. In my AC:GC and early AC:WW days, I didn’t put too much thought into town names, so I ended up regretting them later on (ie. 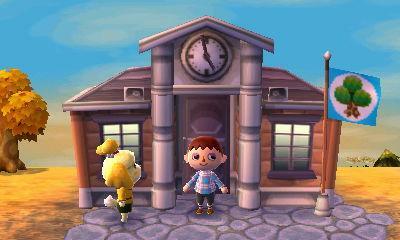 my first AC:WW town, Cutetown). For my most recent towns, Dafdilly in AC:WW and Seahaven in AC:CF, I put a fair amount of thought into the town names and still love them to this day. I tried to have each name match the feel/concept for its town. Dafdilly brings to mind “daffodil” and I often had many flower fields and flower-themed paths around town. There’s also something whimsical in the name Dafdilly that’s reflected in the pastel house styles with their checkered doors and the almost gaudy patterns I’ve used, like my CandyLand patterns and my first pastel rainbow brick path bordered by matching flowers. Seahaven’s planned concept was much different; when I hear the name, I think it sounds like a place that’s calm, peaceful, and elegant. To reflect this, I wanted a palace gate, lighthouse, fountain, white stone main paths, white pebble side paths, and neatly canalled streams, but I didn’t get that far in AC:CF. Of course, I want my AC:NL town name to be just as fitting for its fairytale city concept (described earlier) as my previous town names were for their respective town concepts. Though none of the town names I’ve come up with so far have made me think, “that’s the one, it’s perfect!” to the extent that Dafdilly and Seahaven did when I came up with those. So hopefully I will either think of something even better between now and June 9, or (with the help of your feedback! 😀 ) I will decide that one of the town names I’ve already come up with is the best option. How I came up with it: Ys (pronounced EESS) is the name of a mythical city on the coast of Brittany that was swallowed by the ocean. I have read a book series inspired by the myth (but it was not the myth itself), and in that series Ys was a beautiful coastside city that really appealed to me, so having my AC:NL town called Ys as well should bring to mind related images, feelings, and other associations. I also like the album called Ys by harpist and singer-songwriter Joanna Newsom. Why it could be fitting for my AC:NL town: Since Ys is a legendary, mythological city, I think it’s clear why it could possibly be a fitting name for the fairytale city concept I’m planning. According to the myth, Ys was the richest trading port in the Atlantic, so it would make sense to have the extravagant Märchen buildings and decorations I want in my AC:NL town. Another thing that’s fitting about it is that AC:NL towns have an increased coastline, and Ys was a coastside city. Reservations about this town name: If I were playing AC:NL on my own — no blog, no WiFi — I might have less hesitations about using this name. But I hope to blog about my town and WiFi a fair amount, so what other people might think about my town name factors into my decision somewhat. (And that’s why anyone reading this post would be very helpful in providing feedback! 🙂 ) My reservations about naming my town Ys include that it’s not obvious how to pronounce it, and that the source of the name (the myth) might not be extremely well-known. So it might seem like a fitting town name to me, but it could seem strange to someone who has never heard of the mythological city of Ys. Will looked around carefully. Behind him the full moon shone down over a distant prospect of great green hills, and on the slopes at the foot of the hills there were houses with rich gardens, and an open parkland with groves of trees and the white gleam of a classical temple. The air of the place had something Mediterranean or maybe Caribbean about it. Will had never been out of England, so he couldn’t compare it with anywhere he knew, but it was the kind of place where people came out late at night to eat and drink, to dance and enjoy music. Except that there was no one here, and the silence was immense. Little grocery shops and bakeries stood between jewelers and florists and bead-curtained doors opening into private houses, where wrought-iron balconies with thick flowers overhung the narrow pavement, and where the silence, being enclosed, was even more profound. The streets were leading downward, and before very long they opened out onto a broad avenue where palm trees reached high into the air, the underside of their leaves glowing in the streetlights. On the other side of the avenue was the sea. Will found himself facing a harbor enclosed from the left by a stone breakwater and from the right by a headland on which a large building with stone columns and wide steps and ornate balconies stood floodlit among flowering trees and bushes. In the harbor one or two rowboats lay still at anchor, and beyond the breakwater the starlight glittered on a calm sea. Why it could be fitting for my AC:NL town: First of all, I simply like the way Cittàgazze sounds. But I also like it because it brings to my imagination all the associated mental images I have with the beautiful description above. When I read that description about the ornate towers and domes in Cittàgazze and look at the fan art above, I think the Märchen decorations, especially the town hall, might be fairly fitting and evocative of the same mood. There are other bits and pieces that could be easy to emulate in my AC:NL town: “houses with rich gardens,” “an open parkland with groves of trees,” and “a broad avenue where palm trees reached high into the air.” I will also just try to capture the general feel of Cittàgazze in my AC:NL town: the mystery, wonder, and beauty of the city, and the feeling that it’s the “kind of place where people came out late at night to eat and drink, to dance and enjoy music.” The fact that Cittàgazze is a city near the sea is also fitting since Animal Crossing towns are always near the sea. Now that I’ve gone over my ideas for my own AC:NL town name, I thought I could go over some other methods for coming up with town names for others who might be having trouble deciding what to name their future AC:NL town. Maybe some of it will help, or maybe not! Edit: I ended up creating a separate Town Name Ideas & Methods page, but you can still browse below if you want to see the initial, simpler, shorter list. Method 1 — Drawing inspiration (or directly taking from) video games, movies, books, music, art, real places, mythological places, etc. Just like Ys and Cittàgazze for me, maybe there is a special location name from a book, movie, or video game that you like and that has special significance to you, so naming your Animal Crossing town after it will make your town that much more special. I know I’ve seen many people take names from Zelda, Pokemon, Twilight, The Hunger Games, and so on. I personally like many of the location names from the Lord of the Rings; TheShire (or just Shire), Hobbiton, Bywater, Lórien, Rivendel, Nimrodel, Valinor, Ithilien, Fangorn, Rohan, Númenor, Bree, and Mirkwood are all examples that fit the character limit. You can also draw inspiration from a certain source, but modify it in some way, ie. Mistwood instead of Mirkwood. Method 2 — Stringing various syllables together: Another way to come up with a town name (and I find it pretty difficult) is to put different syllables or sounds together to create a brand new name. It doesn’t necessarily have to make sense or have a certain meaning, and maybe if you brainstorm hard enough, you’ll think of a great unique town name that doesn’t yield any google search results (ie. 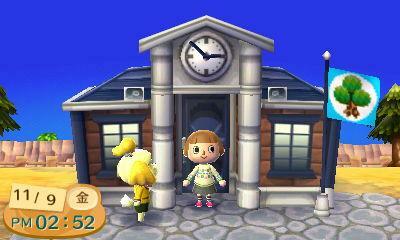 Jemma’s second AC:WW town, Ebatong). A town name created with this method can also hint at a certain meaning (via the syllables/roots used), but still remain somewhat abstract. 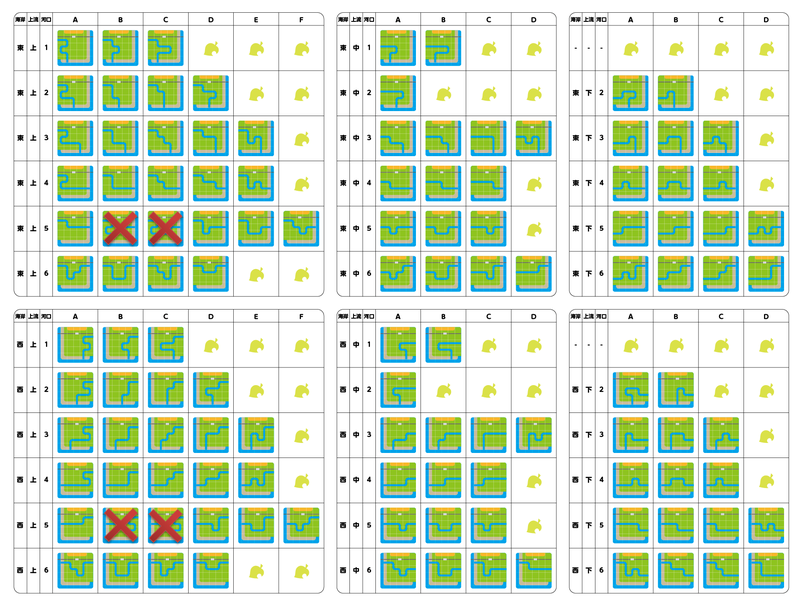 Method 4 — Putting two words together: Even if you might be unfamiliar with viewing this as a specific method, I’m sure you’ve seen many town names like this before, like all the names with a four letter word and “town” at the end. I came up with the town name Seahaven using this method. Below I’ll list some basic beginning words and ending words (though there are countless others) that you can mix and match together to produce a town name. 1) To use the list below, I recommend browsing one column at a time rather than one row at a time. Picking a certain word from one of the columns, then going through the other column to see if there’s a good match, is a good way to come up with a nice town name. You can also come up with your own beginning/endings, of course. 2) It’s important to keep the 8 character limit in mind when coming up with a town name this way. To use Seahaven as an example, “haven” is five letters, so I could only use three letters for the beginning word. There are numerous three letter words you can place there: Sunhaven, Oakhaven, Skyhaven, Oldhaven, Newhaven, and so on, but I liked Seahaven best. 4) The beginning words and ending words are somewhat flexible. Some words can be used for either the beginning or ending. Maybe I’ll try to keep the list above updated as I think of more, but that is enough to start with for now. I hope it might be helpful to someone, it can produce some nice town names: Fairview, Oakglade, Firshade, Sunshore, Goldleaf, Lilywood, etc. For specifically coming up with a town name for AC:NL, maybe thinking about the new features in the game could stir your imagination on a name that would be fitting: the new “official tree,” the increased coastline, the cliff-side beach, the nearby city, the island, the 3D, and the new outdoor customization options. For example, if you want to use the Japanese outdoor decorations, maybe you’ll want a Japanese-inspired name. Sorry for writing so much! >_< And thanks to any of you who got through it all. 🙂 I appreciate opinions/views on my town name debate in the comments section and votes in the poll I set up! On a side note, I'm still working on getting Dafdilly back in order so that I can catch up to the present and play in it and post on it regularly again. Hopefully in a week or two I will be about done with that or made significant progress. Posted on February 23, 2013 by Amy •	This entry was posted in AC:NL and tagged Animal Crossing. Bookmark the permalink. 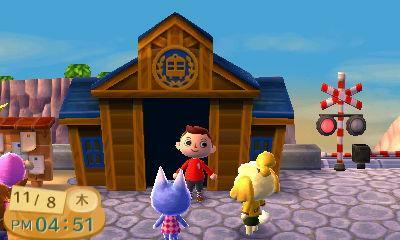 Hi Amy 🙂 It’s good to hear from you again 😀 It’s nice to see you joining in the AC:NL spirit and thinking about the game I like those town hall and train station designs… very classy 😆 I also like those names you came up with, Citalune is my favourite, sounds kind of like CityLune so it would kind of seem like a town rather than a village 🙂 I’ll try and vote on the poll when I stop having problems with my laptop, windows can be kinda wierd sometimes 😆 Anyway (wow I say that a lot 😕 ) I like the town names list thingimadoohickey, could I use some of the name parts? Yeah, languages with Latin roots often have similar sounding words. City in English, Città in Italian, Cité in French, etc. Ohh, Redbourne won’t fit, maybe Redbourn or Redbern instead. It’s a nice name, though, and would be good for a laid-back town like you want. 🙂 The way the list is supposed to work (which I probably didn’t make clear) is that you browse one column at a time, pick one word you like from it, then browse the other column for a word that will match it well. If glade is what you meant to type, I really like that ending too! I guess the key is finding the perfect three-letter word to go in front. Glace is also cool, it would be fitting for an icy town because it reminds me of glacier. It would be unfitting though, because it means “valley” if i remember. xD But i’ll choose it anyway. ^_^ The music theme got me inspired from Mario Kart 7… where it had this Music Park kind of map. 😀 I thought I could make them come to life in AC:NL! Yep, dale, dell, and del are all endings that mean valley, and vale means river valley. I didn’t think there was anything unusual about Alt Dale/Valley, though. 🙂 [EDIT: Whoops, I forgot that the town map/layout is much different in AC:NL. In previous games, the town did give an impression of a valley (with the cliffs on three sides), but in this game, it’s almost more island-like. So you’re right, my bad!] And Altville is good as well. I look forward to seeing what your musical town will be like and visiting it once it’s complete! I’m a little concerned about the whole planning aspect of landscaping. The villager signs aren’t around town anymore, so new neighbors can just plop down anywhere they want and mess up your plans. I guess you have to wait until they’ve all moved in before you can plan, but what about when they leave, and someone else takes their place? Will the replacement neighbor choose somewhere else randomly again (and therefore mess up plans), or will they move into the vacant spot that the old neighbor just moved out of? I do think you can deny certain projects, and you can also demolish them later if you build one and decide you don’t like it / want it somewhere else. But there are benefits to installing new projects that your neighbors request, like boosting your town status. I plan on my town being reminiscent of an old fantasy-like town, but not Alice in Wonderland specifically. I remember I considered something like “Wondrlnd” for my AC:WW town, but it’s too mangled, so Dafdilly was the better option. 😛 I wish they would’ve increased the character limit for town names in AC:NL, but I’m pretty sure they didn’t. 😦 Oh well. What an in-depth guide to creating town names! I personally like the first method best, though your list in method 4 gives some tempting suggestions. I really like the combinations that give an impression of the English countryside (though I've never even been there ^^; ). 3. The centre acre at the top of town is always occupied by the station. That’s why it was easy for me to settle on one favourite map, though getting it is another matter 😛 Here’s a good pic of all the delicious fruits. My dad plays video games, but not Animal Crossing anymore (maybe I can get him into AC:NL?). My mom also doesn’t really like video games, especially violent ones or addictive RPGs that take up too much TV time and are loud (like my dad plays these days :P). But she doesn’t mind Animal Crossing, we even made a character for her to live in Red Bank with my dad’s character. I think the concept of Animal Crossing is amusing to her. Thanks for the picture of the delicious fruits! I do like the appearance of the delicious apple, peach, and pear (but in general, I’d rather have a different official town fruit than the pear…). The delicious orange is kind of weird looking. I like the thought of swimming to a secret beach too 🙂 In general I can’t wait to explore the cliff-side beach and waterfall, it looks beautiful. Ooh, I googled that and it does look just like the delicious fruit in AC:NL, from the color to the speckles. I’d love to get apples as a native fruit! But I guess I’m open to others as long as everything else is great. Oh okay, thanks! 🙂 At the moment it’s just between Citalune, Ci’gazze, and Ys because I feel those names fit my fairytale city theme best. Lilywood wouldn’t be as fitting for that theme, but it it’s a nice name, maybe you could use it if you ever make a new AC town? 😛 Or a Harry Potter inspired town name would be good; it’s a shame Hogsmeade has too many letters for the limit. I love your blog and i read it every day. I’m also a friend of Choco. Hi Lisa! Thank you so much, I appreciate it! 🙂 I hope I can post again in the next week or so. Yeah, I heard ACNL works with my internet so we probs can wifi! Also, are you planning to make a dafdilly dress in acnl? it would look awesome. And Guess what! I can wifi In City Folk and New Leaf!!! Yay! Yay, I look forward to WiFing in AC:NL! 😀 I have City Folk, but it’s not connected to the internet and I don’t play it anymore. I haven’t thought about making the petal dress in New Leaf, but I guess it would be easy with all the new palette options; I could probably even improve it or change the color scheme. And thanks a lot for the input on my future town name! The “lune” does give Citalune a nighttime sort feel, I think. Ah, New Leaf how I wish to have you. 😆 I love the name Citalune, whenever I read it I imagine a Professor Layton type historical town basking in moonlight, but that’s just me. I can’t wait until New Leaf’s released and I can finally WiFi with you! We have been waiting two years after-all. 😆 As for my town name I’m unsure, I need it to be right or I’ll just end up resetting later. I was thinking maybe Capella named after the eleventh brightest star in the night sky. The name also reminds me of a pricey Italian ice cream, which is a plus. Hi! 🙂 Oh wow, thanks for letting me know about that, I had no idea. It’s good I’m not going with that one. 😛 And thanks a lot for the feedback! ^_^ Unless an amazing different town name idea comes to me between now and June 9th, I think I’m going with Citalune.